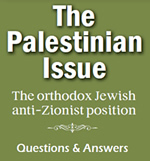 In the past week the late so-called Chief "Rabbi" of the so-called State of "Israel", Mordechai Eliyahu, and other irresponsible "Rabbis" employed by the Zionist State have made vicious and provocative statements asserting that Authentic Jewish Edict allows or permits harming or injuring Palestinian individuals in the Gaza Strip, thereby falsely legitimatizing the Zionist massacres in that area. Mordechai Eliyahu and his friends are not in any way authentic Torah authorities, despite the fact that they carry the so-called titles of "Chief Rabbi" and the like. "Rabbis" of the Zionist State only carry legitimacy in the eyes of Zionists. Their status as a "Rabbis" is not much different from the leadership of Theodor Herzl, who also wore a long beard! The State of "Israel" is absolutely illegitimate according to Torah teachings. The founding of the State of "Israel" is in direct contradiction to the teachings of the Torah which forbids the establishment of a Jewish state and commands Jews to remain in exile until released from that exile by G-d Himself, without any human intervention, at which time all nations of the world will live together in peace. Palestinians have the basic human right to return to their land in historic Palestine and to establish their own independent state in the entire Holy Land, which was forcefully taken from them by the Zionists. Indeed, many Gazans are refugees who were expelled from other areas of Palestine by the Zionists in 1948 and have been denied access to their property ever since. Chief Rabbis of the Zionist state, whether Eliyahu or anyone else, are merely very well-paid stooges of the Zionists and serve their Zionist masters without regard for the welfare of the Jewish People, the Palestinians, or any other people in the world. The Chief Rabbinate of the Zionist State, just as all Zionist institutions, has importance only because of its coercive power over the religious, economic and everyday life of the Jewish residents of Zionist occupied Palestine. Whoever recognizes and supports the Zionist State, even innocently, has been taken over by the heretical Zionist movement, no matter how large the halo that it is granted by supposed Jewish authorities. Chief Rabbis, and other rabbis who support the existence of the Zionist state, are wicked emissaries of evil. Such "rabbis" promote hatred and war, and use their coercive powers to demand subservience of Jews to the Zionist enterprise. This description that we posit of such people has been and remains the long-standing position of authentic rabbis for the last century. Mordechai Eliyahu and his friends express feelings of inhumanity that originate from his loyalty to the Zionist cult and they are perfectly prepared to sacrifice Jewish lives on the altar of this idolatry, the State of "Israel." Any moral person would much prefer to see the Zionist warmongers, including Eliyahu, removed from the Holy Land. ELIYAHU AND ALL OTHER ZIONIST RABBIS DO NOT REPRESENT THE JEWISH RELIGION. The Great Rabbi and Authentic Jewish Authority Rabbi Yisroel Meir Kagan of Blessed Memory (author of the codex "Mishna Brura", & "Chafetz Chayim" found in every Jewish home) repeatedly iterated that Torah Command to destroy seed of the wicked Amalek covers those apparently Jewish individuals, who are only so by merit of having been born into Jewish families, who are dedicated to oppressing the faithful. Rabbi Kagan's foremost prodigy, the Holy Rabbi E. Wasserman went further to specify that this implies the leaders of the Zionist movement and State who so befit this profile. The brazen attempt of Zionist "Rabbis" to falsify those exact passages from the Torah that are meant to convict themselves to condemn the Palestinians is unprecedented! May Almighty G-d protect us from the influence of Zionism in general, their evil warmongering bloodthirsty leaders, and from their wicked servants who call themselves "Rabbis".